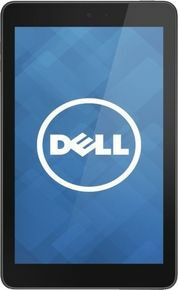 The Dell Venue 8 is a WiFi Android tablet, giving you access to so many applications and games. It has a powerful Intel Atom processor Z2580 (up to 2.0 GHz Dual-Core) that enables you to enjoy a speedy computing experience. Dell Venue 8 Tablet has a large 8-inch IPS multi-touch capacitive touchscreen with HD display and 1280 x 800 pixels resolution that produces colour enriched images and videos on the tab screen. Its sleek and slim build enhances its good looks as it measures less than 9.5 mm, making it so easy to carry along. Dell Venue 8 Tablet price in India for 16 GB is around 10K and for 32 GB is 13K. Buy Dell Venue 8 Tablet online that features Android v4.2 Jelly Bean operating system with 2GB RAM that delivers hi-speed performance and internal memory is available in 2 variant that is 16 GB and 32 GB. You can store your files, videos and other multimedia applications easily as it has also a microSD slot for up to 32GB of additional storage. Dell Venue 8 Tablet specification also includes a 5 MP camera on the rear with no flash, and a 2MP camera in front for self-portraits. Neither camera is very sharp, but it's hard to imagine taking serious photos with an 8-inch tablet. You also get the standard set of Android apps, such as Chrome, Gmail, Hangouts, Drive and Google+. All access from anywhere PocketCloud 2.0 gives you access to your content and applications from a PC, smartphone or tablet so you can update and share your files wherever you go. Buy online Dell Venue 8 Tablet that is also compatible with Wi-Fi networks and allows you to browse web applications at a super-fast speed. The Venue 8 has a 4,550-mAh battery that will last you most of the day. Dell's tablet delivered 7 hours and 57 minutes of runtime on Laptop Mag's battery test. If you are looking for a compact and competitive device having a powerful Intel Atom dual-core processor than you can compare online prices from various online stores like Flipkart, Snapdeal, Amazon and etc. and find the lowest online price to get this amazing tablet.